To avoid yielding to temptation – Jesus said watch and pray, that ye enter not into temptation. The spirit indeed is willing but the flesh is weak (Mathew 26:41). The weakness of our flesh does not prevent temptations from coming our way. We are on a battle field – The act of soul winning is important to the devil as it is to God. The devil is looking for as many as he can take with him to hell. For this purpose the Son of God was manifested, that He might destroy the works of the devil (1 John 3:8). Clearly, this is a spiritual battle (Ephesians 6:12). Therefore, let us not sleep… but let us watch and be sober (1 Thessalonians 5:6). We have something that the devil is after (power) – We have been empowered by God (Luke 10:19) and the devil knows this is not an ordinary power as we are able to pull down his kingdom with this power. Hence, he is looking for ways to make us lose the power (1 Peter 5:8). Let him that thinks he stands to take heed lest he falls (1 Corinthians 10:12). There are so many distractions in the world – If we are not watchful, our physical needs will overshadow our desire to obey God. In our text, the physical needs of the three disciples overpowered their desire to obey God. But the end of all things is at hand: be ye therefore sober and watch unto prayer (1 Peter 4:7). 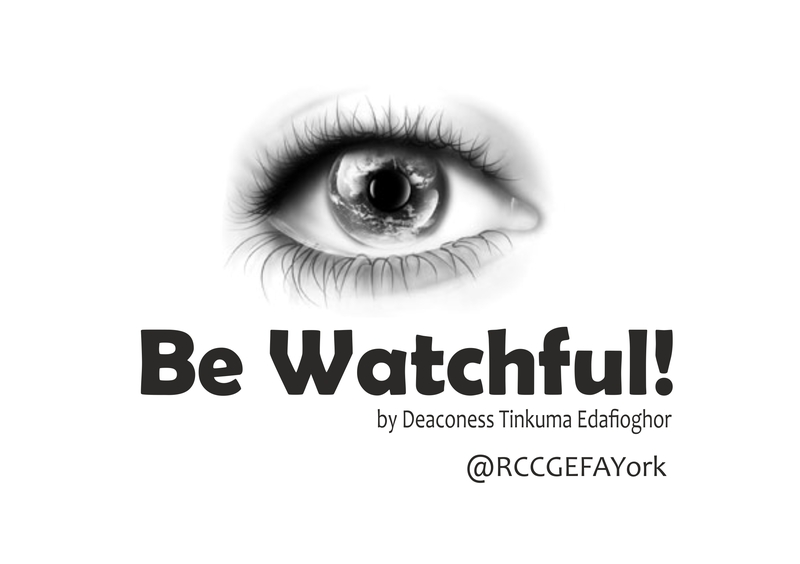 The sermon Be Watchful, by Deaconess Tinkuma Edafioghor was delivered on January 17th 2016.